Penguin Pools offers many different types of steps for your inground pool, however, fiberglass pool steps are the simplest and most cost effective. 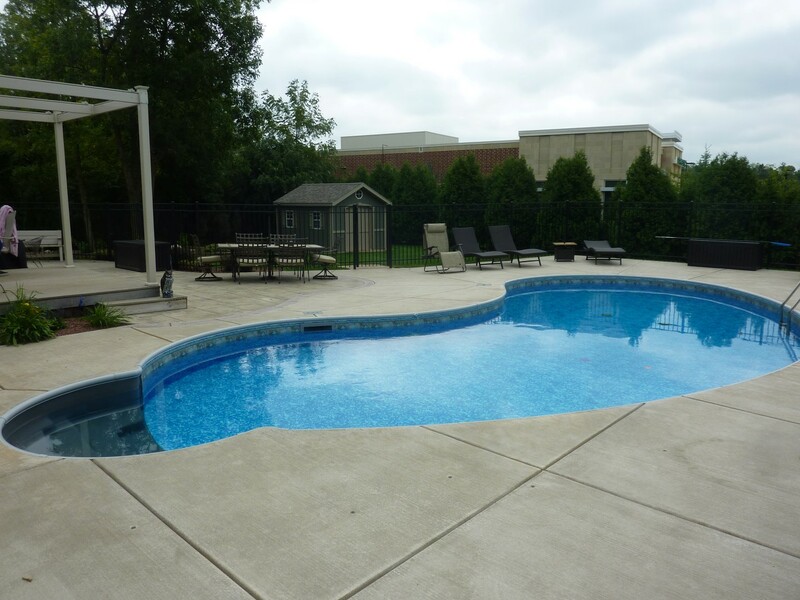 The pool step layout and position can be dictated by the use of an auto cover or a water feature, however, they will be laid out with your overall vision of the pool. Penguin Pools offers 4 types of inground fiberglass pool steps with a variety of styles. Depending on your type of swimming pool, a certain type and style will be best. Penguin Pools offers walk-in fiberglass pool steps with each inground swimming pool build for Southeastern Wisconsin and Minneapolis. The 8′ Roman fiberglass pool steps (in white) come standard with all of our swimming pools. The Roman Steps are also available in 6′ and 10′ sizes. 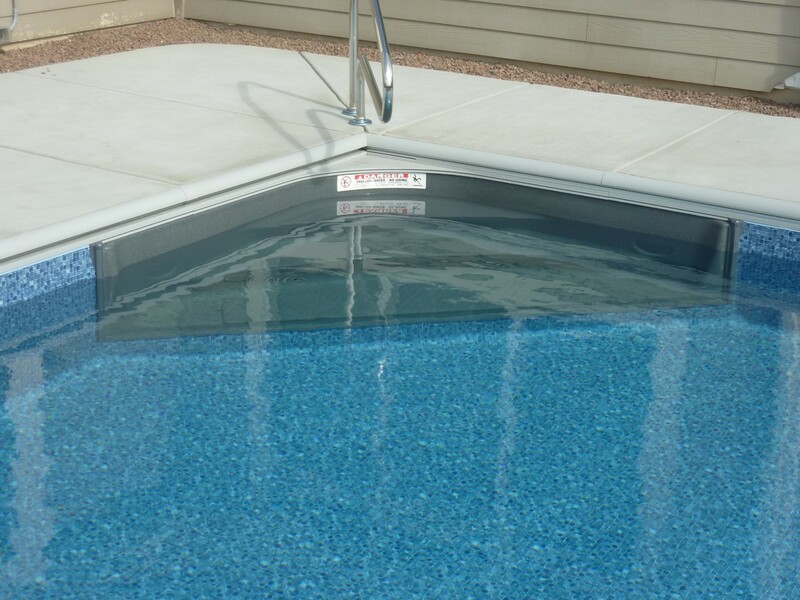 For our customers that are putting an auto cover on their swimming pool and don’t want a vinyl liner covered pool step, we offer 2’or 6′ radius in-pool corner fiberglass pool steps. 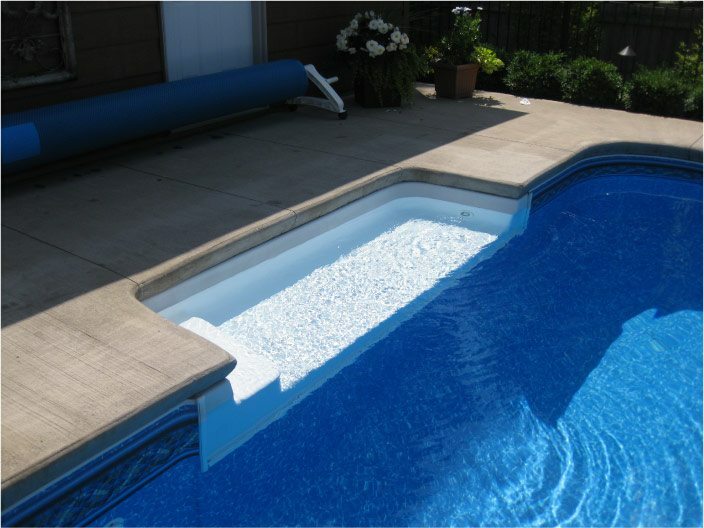 These fiberglass pool steps allow the auto cover to completely cover the pool. Simple wall inserts can give you an added sun ledge to sit and enjoy the sun. Sun decks and loungers are a great compromise for those whom custom steps won’t fit in the budget, but still want an aesthetic way to allow swimmers to get in and out of the pool. 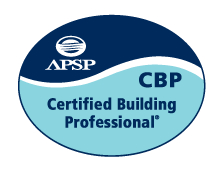 Our sun ledges are 8′ long and have 6″ – 8″ of water on them when the swimming pool is filled. Great as a swimout in the deep end of a pool or just a place to sit and relax.